The growing recognition that Los Angeles has been the single most important center for avant-garde, experimental, and minority filmmaking has provided the ground for a number of recent historiographical, curatorial, and institutional initiatives. Chief among these was an extended collaborative project undertaken by the Los Angeles Filmforum, an independent screening organization that has existed continuously since 1975, together with the Getty Foundation s Pacific Standard Time: Art in L.A. 1945 1980, and the University of Southern California s School of Cinematic Arts and its Arts and Humanities Initiative, Visions and Voices . Its first accomplishment was a three-day symposium featuring scholarly presentations, screenings, and discussions with filmmakers held at USC in November 2010, followed the next year by a screening series of some three hundred films and videos, many of them newly discovered and/ or restored by the Academy of Motion Pictures. Concurrently Filmforum under- took an archival research project consisting of nearly forty videotaped and transcribed oral histories conducted with filmmakers. Alternative Projections: Experimental Film In Los Angeles, 1945 1980 is a ground-breaking anthology that brings the conference papers together with specifically commissioned essays, an account of the screening series, reprints of historical documents by and about experimental filmmakers in the region, and other rare photographs and ephemera. With contributions from scholars, graduate students, archivists, curators, and filmmakers from three continents, the resulting diverse and multi-voiced collection radically extends film historiography. 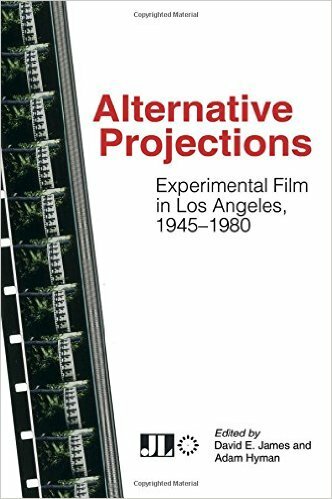 It is of great importance, not simply for its relevance to Los Angeles, but also for its general discoveries and projections about alternative cinemas. David E. James is on the faculty of the School of Cinematic Arts at the University of Southern California. His books include The Most Typical Avant-Garde: History and Geography of Minor Cinemas in Los Angeles (University of California Press, 2006). Along with several collections of essays on avant-garde filmmakers, he edited The Sons and Daughters of Los: Culture and Community in LA (Temple University Press, 2003). Adam Hyman has been Executive Director and Programmer for Los Angeles Filmforum since 2003. He is also a documentary filmmaker, producing and/or writing a variety of historical and archaeological documentaries that have aired on the PBS, the History Channel, the Learning Channel, and others.